What is Nolvasan Otic Cleansing Solution (Isopropanol) used for? 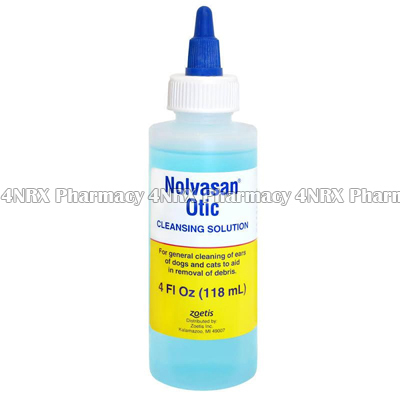 Nolvasan Otic Cleansing Solution (Isopropanol) is an ear cleansing solution used to clean the ears of dogs. It contains a mild alcohol that gently disinfects and removes mites, dry skin, ear wax, and other irritants from the skin. Your veterinarian may also recommend its use for the treatment of other conditions that are not listed here. How should I use Nolvasan Otic Cleansing Solution (Isopropanol)? Nolvasan Otic Cleansing Solution (Isopropanol) is normally used twice each day to clean your dog's ears using a soft cloth, but the correct directions will be determined by your veterinarian based on your pet's health condition and the severity of its symptoms. To use the medication simply put a small amount of the solution on a soft cloth and gently use it to clean the dog's outer ear. Do not attempt to clean deep in the ear as this may cause damage to the middle or inner ear. Do not allow the medication to contact your dog's eyes, mouth, or other mucous membranes besides its ears. Thoroughly wash your hands using soap and water after each use to prevent the medication from contacting your own skin or mucous membranes. Ask your veterinarian any questions you have about using the solution to ensure the correct administration. What are the side effects of Nolvasan Otic Cleansing Solution (Isopropanol)? Nolvasan Otic Cleansing Solution (Isopropanol) will not cause side effects in most dogs. Stop using the medication and contact your veterinarian as soon as possible if any serious or worrying symptoms occur being especially careful about signs of an allergic reaction such as skin rashes, swelling, or trouble breathing. These conditions may require reduced application frequency or immediate medical assistance in serious cases to prevent further health problems from occurring. Nolvasan Otic Cleansing Solution (Isopropanol) is only meant for external use and should not be used to treat other animals such as cats or humans. Do not apply the solution to skin that is broken or severely damaged. Strictly follow all instructions provided to you by the veterinarian while using Nolvasan Otic Cleansing Solution (Isopropanol). Optimum and safe dosage can differ based on the dog and the condition being treated. As this medication may be unsafe for certain dogs, it is essential you always inform the veterinarian if your dog is pregnant or nursing, as well as if it has any allergies, other illnesses, or ongoing health conditions, and if it is taking any other form of medication, supplements, or herbal products.